Growth in China is slowing, growth in Europe is near zero, and the world as a whole is now in recession in dollar terms. At the same time, income inequality is rising all over the world, and political instability is going up, too. Could a return to economic growth be the cure for these ills? And if so, how do we achieve it? Peter De Keyzer, chief economist at BNP Paribas Fortis, examined the issue in his book “Growth Makes You Happy”. Taking a long-term perspective, he starts with a simple theory: wealth is determined by two factors, population growth and productivity growth. The latter depends on your ability to innovate. The former is a result of individual choices and the state of healthcare in a country. But which can get us back to healthy growth? It’s simple: the more working age people a country has, the more likely it is to have economic growth and increasing wealth. As The Economist noted earlier this year, “people will borrow in their 20s and 30s, save a lot in their 40s and 50s and start running down their savings in their 60s”. The more working age (age 16-65) population you have, the more potential contributors to economic growth, both because of their productivity and their spending. The previous insight does not constitute a call for unbridled population growth, though. 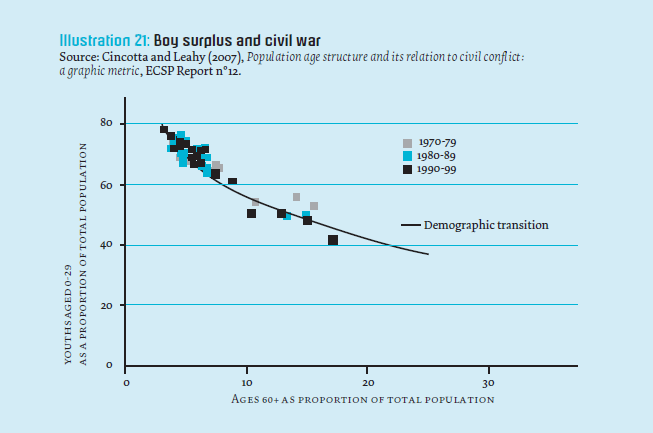 When a country’s population grows too fast, it is likely to run into trouble: studies show that the higher the percentage of “fighting age” population (16 to 30 year-olds) in a country, the higher its chances for civil unrest, instability and war. The tipping point is when more than 60% of the population is younger than 30. In that case, the chance for civil war is a staggering one in two. It helps explain the difficult transition countries like Congo, Iran, Iraq, Pakistan and Palestine are going through. Can this surprise anyone? When women are better educated, countries are more likely to see a balanced economic growth, because their demographic transition is more balanced, too. 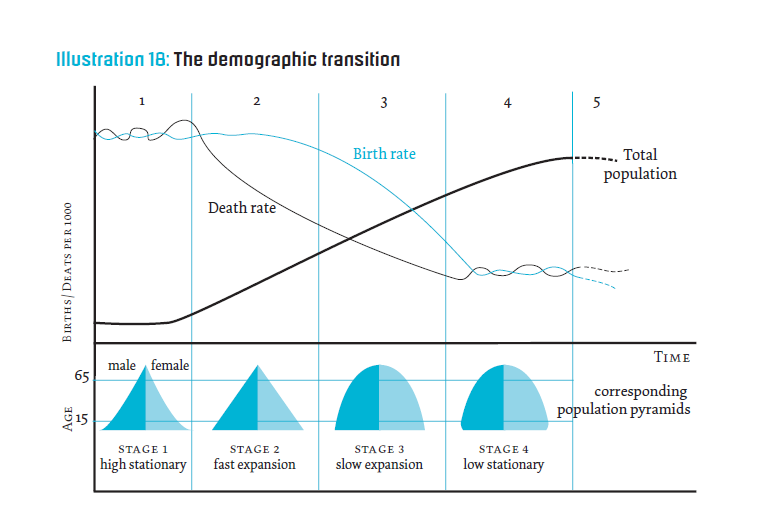 In such societies, the demographic pyramid is more likely to be one of “slow expansion” or “low stationary” rather than “fast expansion” (see below). 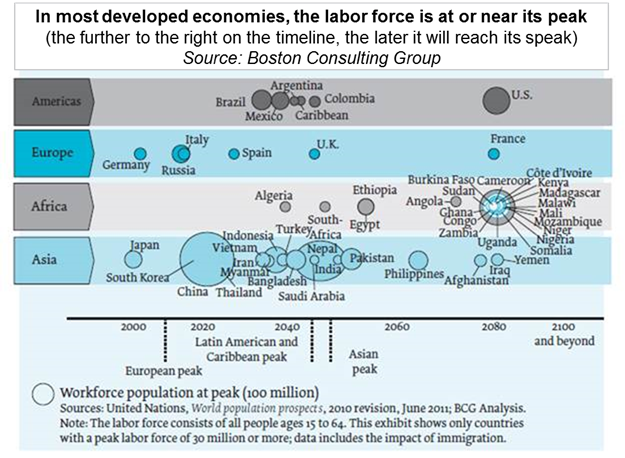 For countries who no longer have a demographic “dividend” of growing populations, the only other way to increase their future wealth is to engineer the second economic growth component: productivity growth. Such is the case for many western countries today, countries such as Japan and Germany have already passed “peak population”. Necessity is the mother of invention, as Plato knew long ago. It is no coincidence then that the upcoming “Fourth Industrial Revolution” and its accompanying explosion of productivity seems to take off first in countries like Japan and Germany. Japan is increasingly inventing robots that have the artificial intelligence to take on a broad variety of jobs, while Germany leads the push towards “smart factories” in its industry. How do we make sure we reap the benefits from artificial intelligence, robots, and other 21st century productivity enhancers? Productivity growth in the 21st century largely depends on innovations, and innovations can come about only if you have a well-educated population, and a considerable amount of research and innovation centers. As Maria Mazzucato would agree, that in turn depends on the emphasis governments put on education, research and development. Private companies and the free market will decide which innovations are worthwhile, but their breeding ground is the level of education a given country has. In conclusion, education seems to play a decisive role in getting the world back on the economic growth track. To ensure demographic growth leads to economic growth in emerging markets, the emphasis should lie on a smooth demographic transition. That depends on how well educated women are. To ensure the demographic decline in the developed world doesn’t lead to an economic slump, an increased focus on productivity growth is necessary. In the 21st century, that will come mostly from an increased focus on education, research and development in general.